It’s hot and steamy away from the Sangatta River but a distant boom lures us deep into the forest where wild orangutans roam. The air thickens as the canopy closes overhead and we sweat along skinny foot trails, craning our necks skyward at every rustle and crossing our fingers, searching for a telltale flash of amber in the towering treetops above. Spotting wild orangutans is a hit or miss affair in Borneo where logging and poaching have kept our closest animal relative on the endangered species list for decades. Populations continue to dwindle but there’s good news coming out of Kutai National Park in eastern Kalimantan. And it’s in this sanctuary that was all-but written off as a conservation disaster afters decades of plundering and two devastating forest fires – that we get lucky. Suddenly, she appears: swinging down daringly towards us, a tiny, fuzzy daughter clinging to her hip. She closes the distance between us in seconds, and a stab of fear grips me until she stops just metres away, arms outstretched, watching her watchers with calm, curious intent. My relief is instant and the wave of emotions that follows overwhelms me. I’m awestruck, stunned and thrilled, utterly gripped by her lingering gaze. Slowly and with ease, she makes her way to a favourite feeding tree, staying low within mesmerising, clear view. 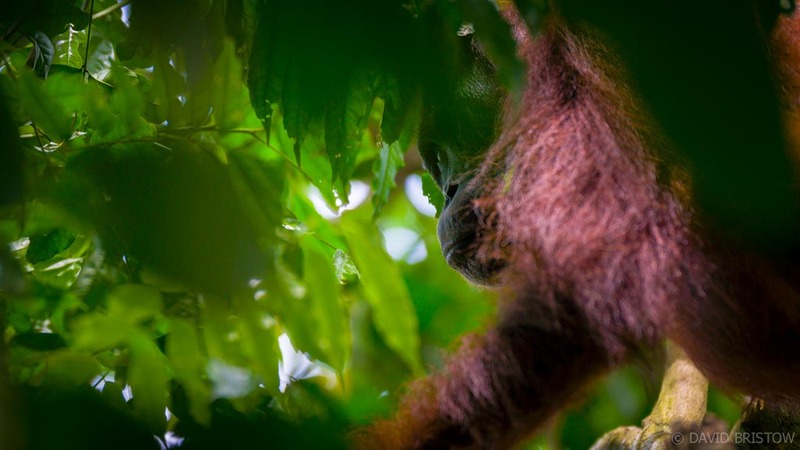 Above her in the canopy we spot another much smaller orangutan – her seven-year-old son – building his own leaf nest and settling in for the night. When mother and baby follow suit, climbing effortlessly into the canopy, we retreat to our own primitive digs in the park rangers’ hut: a mattress under a mossie net, a barking owl at our window and a room lit up by fireflies that sparkle across the ceiling throughout the night. A troope of macaques wakes us at dawn and we return to the orangutans, discovering them 400 metres from their night-time nest, feeding high in the canopy. We wait and watch and wait some more, and finally they down climb into view, moving slowly and staying low enough for us to take in tiny details: this infant’s fuzzy, barely-there hair; mum’s strong curling fingers as she gently lifts baby onto her back; the deep auburn of her fur, arm outstretched, delicately selecting fresh, green leaves. Hours pass and the feeding ends. The trio moves into thicker, shadier foliage to rest, Mum playing with her wildly energetic baby until it’s time to take a break. We leave the orangutans reluctantly, but beaming; buoyed by two incredible encounters and thrilled that the orangutans everyone gave up on are standing their ground in Kutai. Just a decade ago, conservationists dismissed Kutai National Park as yet another Indonesian wasteland, ruined by logging and mining, illegally settled, its animal populations decimated. Two extensive wild fires in 1982 and 1997 ravaged so much of the orangutans’ habitat that researchers estimated the park’s priority population had dwindled from 600 down to a woeful 30 individuals. Following these revelations, travel guidebooks around the world turned travellers’ attention to rescue and rehabilitation centres elsewhere in Borneo and visitation numbers in Kutai plummeted. Fortunately, the researchers got it wrong. Field surveys in 2010 painted a much brighter picture of forests in good shape and an orangutan population numbering upwards of 1000 to 2000 individuals. Today, the Orangutan Kutai Project (headed by the Orangutan Conservancy) runs a field station on the park’s northern border, monitoring the orangutan population close by and providing a much-needed protective presence in this remote and vulnerable corner of the park. The fact that numbers in Kutai are on the rise is exceptional news for this extremely vulnerable subspecies of Borneon orangutans (and its sister species in Sumatra). A quarter of all natural forests in Indonesian Borneo have already been wiped out, and the more travellers who support (and fund) the preservation of these wild lands by venturing beyond rescue centres and feeding stations to observe orangutans in their natural habitats, the better. If that’s you then Kutai National Park offers easily the best chance of encountering genuinely wild orangutans in Borneo. Getting there: Access to Kutai National Park is easier than you might think! Balikpapan is the closer of Kalimantan’s two international airports. From the city, take a public bus to Samarinda (two hours, 38,000Rp – AUD$4), a bus to Sangatta (four hours, 55,000Rp – AUD$5.50), a car to Kabo Jaya (80,000-100,000Rp, AUD$8-10) and ride the park’s longboat to Prevab (300,000Rp per boat). Getting organised: Phone park ranger Pak Supiani on +62 (0) 813 4634 8803 to book your stay in the ranger hut at Prevab and to arrange the boat ride. Fees: Foreigners pay a park entrance fee of 150,000Rp per person, per day, rooms rent for 150,000 to 200,000Rp per night (1/2 people) and ranger-led hikes cost 200,000Rp per hike (2-4 hours). You are required to take a guide with you when hiking in the national park. Arrange to stay at least two nights. Facilities: The ranger hut’s two private rooms are basic but comfortable: mattresses on the floor, a clean sheet and pillows with a new mossie net positioned overhead (we used sarongs as top sheets). The hut’s kitchen has a two-burner gas cooker and there are plenty of pots, pans, crockery and cutlery on hand. There’s a coldwater shower, mandi (scoop shower), two toilets, communal eating area and the power for lights lasts from 6pm until 10pm. You will need to bring all your own food, tea, coffee and drinking water (although you can boil and cool the local tap water). Don’t forget mosquito repellent and a torch.